The SA9904B is a three phase bidirectional energy/power metering integrated circuit that has been designed to measure active and reactive energy, RMS mains voltage and mains frequency. The SA9904B has an integrated SPI serial interface for communication with a microcontroller. 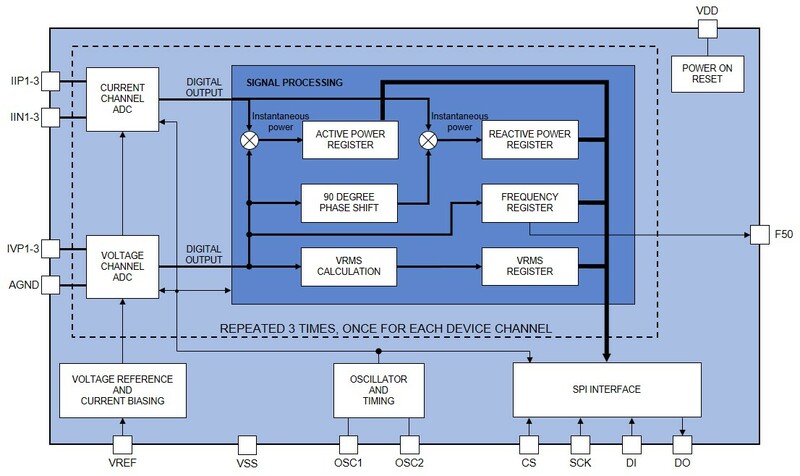 Measured values for active and reactive energy, the mains voltage and frequency for each phase are accessible through the SPI interface from 24 bit registers. The SA9904B active and reactive energy registers are capable of holding at least 52 seconds of accumulated energy at full load. A mains voltage zero crossover is available on the F50 output. The SA9904B includes all the required functions for three phase power and energy measurement such as oversampling A/D converters for the voltage and current sense inputs, power calculation and energy integration. This innovative universal three phase power/energy metering integrated circuit is ideally suited for energy calculations in applications such as electricity dispensing systems, residential metering and factory energy metering and control. The SA9904B integrated circuit is available in a 20 pin small outline (SOIC20) RoHS compliant package.